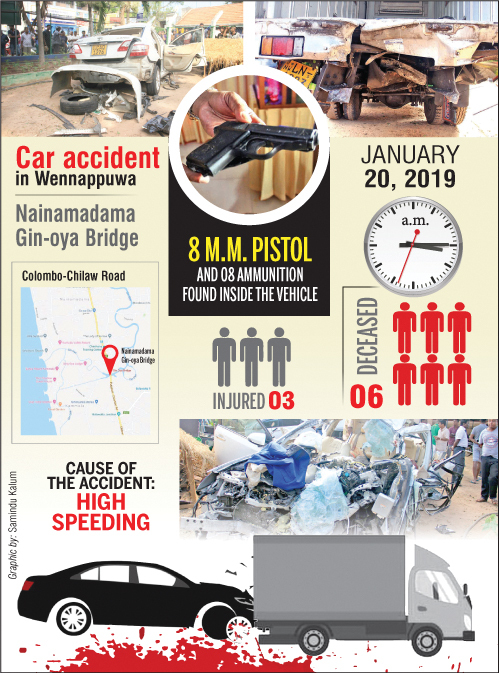 Six people died and another three persons sustained serious injuries when a car collided with a lorry transporting fish near Nainamadama Ginoya Bridge on the Colombo-Chilaw main road in Wennappuwa. The accident took place around 3 am yesterday. 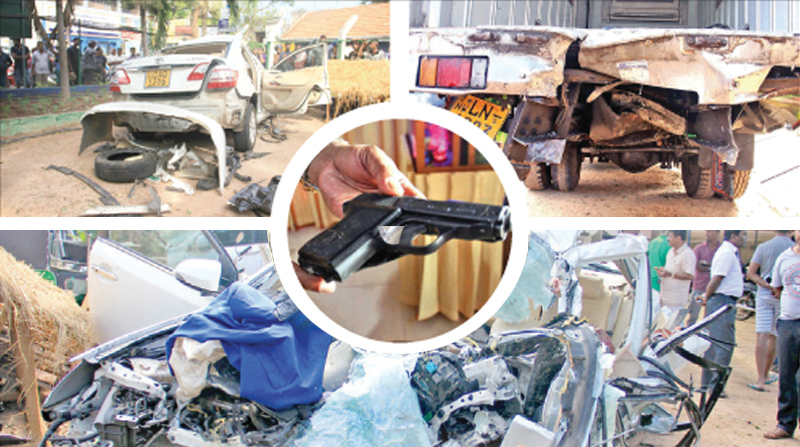 Police found a foreign made pistol in the car which collided with the lorry. At the time of the accident, there were nine persons in the car and they had been returning home after attending a wedding at Waikkal. Six persons had died on the spot and three persons were admitted to the Negombo General Hospital. Two of them were transferred to Colombo General Hospital as they were in a critical condition. Police found the 8 mm pistol made in Italy along with eight bullets hidden under the left front seat of the ill-fated car. Police said the inability to control the vehicle due to high speed was the reason of the accident. The victims were identified as Manoj Anuruddha Fernando (24), Rohana Senevirathna (32), Janitha Rushaan Peiris (26), Wickramasinghe Bandara (34), Pradeep Chandana (36) and Suranga Sanjeewa Fernando (34). They were friends living in Wennappuwa and Galle. The lorry, which was carrying fish from Galle to Chilaw, had stopped after hitting a fence of the bridge after the accident. The car had been severely damaged. Police are conducting more investigations. The driver of the lorry was taken into Police custody for questioning. He was to be produced before the acting Magistrate in Wennappuwa.